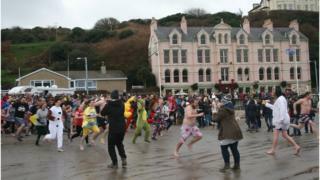 Hundreds of people have braved the Isle of Man's beaches to take part in the annual traditional New Year dips. Fundraising swims took place at beaches around the island including Douglas, Peel, Port St Mary and Port Erin. The Peel dip began in 1983, and the four dips in Port St Mary, Gansey and Port Erin are now in their 16th year. Many took to the water in a variety of fancy dress and raised money for charities including the RNLI. Image caption Organisers described the swims as "exhilarating"
Organisers said the dips were an "exhilarating way to start the year" and a "huge amount of fun" to watch. Hundreds of people lined the beaches to watch and cheer on those brave enough to swim. The Meteorological Office said the sea was usually about 8-9C at this time of year.